Welcome to the official build thread of the Funder & Lightning! I designed and built this plane back in 2005. I'm a big fan of the Lockheed P-38 Lightning and wanted to build a similar flying model out of foam. 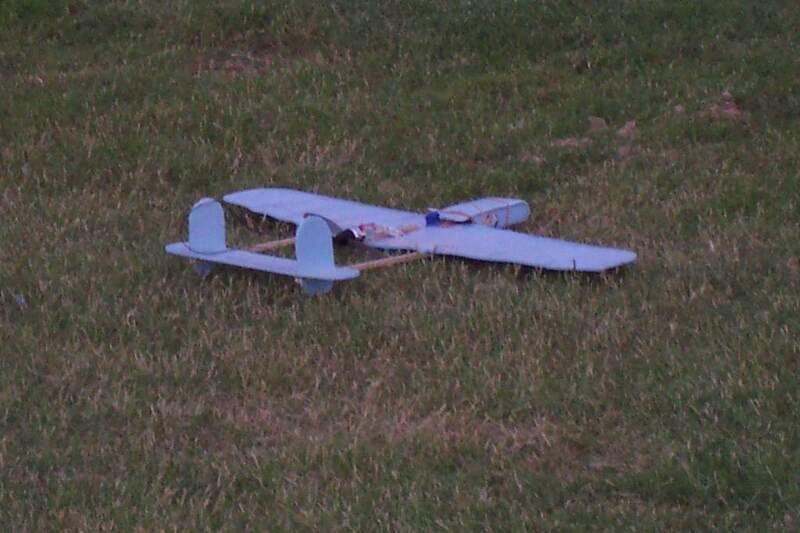 The plane is very simple to build, light on the wallet for parts, and is a blast to fly! This thread has TONS of photos & helpful ideas to help you along. To get you started quickly, here are some popular sections in this thread. If you have additional questions, you are welcome to send me a private message here on RC Groups. - "Welcome to the Funder & Lightning / Part 1"
- "Parts for the Funder & Lightning / Part 2"
- "Building the Funder & Lightning / Part 3"
- "Maiden of the Funder & Lightning / Part 4"
Direct link to version 2 (2010) plans. "Yippee!" Build - Original F&L technical information. Q: What skill level is required to fly this aircraft? A: I believe this design is meant for intermediate builders/pilots. However, a few folks out there have built this as their first plane and have succeeded. You should probably have some time flying a high-wing trainer before attempting to fly a plane this small and fast...and without landing gear. Q: How many channels is this plane? Does it have rudders? A: This is a 3-channel aircraft: Ailerons, Elevator, and Throttle. You do not need rudders to fly this aircraft. Q: Can I buy this kit online? A: At this time, the kit is not for sale through any retail outlet. However, I am looking for a vendor to market/package/sell this aircraft. Until then, you should print out the PDF plans and give it a try. Many new pilots say it is not a difficult plane to build. Q: Can I use arrow shafts or CF tubing for the booms? A: Yes you can. I prefer using basswood or spruce as it keeps the pieces 'true' and provides a larger surface area for glue. Q: What motor do you recommend? A: The market is flooded with 400 sized brushless outrunner motors. You have many choices and combo options. Most of us agree that a 400 size outrunner motor with a KV rating of 1000-1400 turning an 8"-9" prop is an appropriate match. In the beginning, most of my planes were built using the Hobby Lobby 400XT 900Kv motor. It allowed you to run a larger prop (9-10") and fly at slower speeds. My favorite right now is the BP 2212-10 1400kv motor. I use one on my "Yellow Jacket" and it flies great. That, and it only costs $16!! Use a GWS 8x6" HD black prop. Q: Where do I get the foam? A: DOW FFF can be difficult to locate (Lowe's Hardware is a good starting place). It typically comes in a huge block of several foam sheets hinged together like an accordion (thus, fan FOLD foam). You can build 10-15 planes out of one pile. Midwest Cellfoam 88 and Depron are similar and can usually be found at your local hobby shop. I prefer CF88 but it is a bit expensive. Other people recommend paper covered foam sheets available at Hobby Lobby Crafts and Dollar Tree. Q: What glue should I use? A: You could assemble the entire plane with foam safe CA. I recommend using a stronger glue (epoxy or Gorilla Glue) when attaching the booms to the wing and tail. Hot Glue is another option but since it sets quickly, it isn't recommended. Hot Glue IS good for attaching servos to the foam. ** Video of F&L #2, Yippee! Funder & Lightning #1, Prototype. Built with Dow FFF. Funder & Lightning #2, Yippee!. Built with Midwest Products Cellfoam 88. My first three F&Ls. Yippee!, Prototype, & Bubba (given to a buddy). Funder & Lightning #4, Orange Bang. Built with Dow FFF (wings) and CF88 (tail). Funder & Lightning #5, 24" Mini F&L. Built with CF88. Fast little sucker! Funder & Lightning #7. Built for a friend. Funder & Lightning #6 - "Yellow Jacket"
36" Funder & Lightning Yippee! 2011 Design - Funder & Lightning "Honey Bunny"
2017 v3.1 (laser cut) Funder & Lightning. F&L made with Flite Test foam. Here is the first video I made using this setup. The wing is pretty much based on the Blue Funder design. I've rounded the edges....but that's about it. I still use the double-layer leading edge and a carbon fiber rod (arrow shaft) for a spar. *** NOTE *** In version 2.0 of the plans, we increased the depth of all control surfaces to 1.5". This provides a much better roll rate. Last edited by YarSmythe; Apr 18, 2010 at 08:44 AM. Here are some notes about my latest version, F&L #2, Yippee! - Instead of Dow Blue FFF, I opted for Midwest CellFoam 88 - 5mm sheets. It is smoother, a bit stiffer, and regular CA seems to work just fine. Painting it was a breeze! - Because I am not "rolling over" FFF for this wing (see the Blue Funder build thread), I purchased a piece of balsa leading edge stock to fit on the front of the wing. This not only keeps the wing stiff, but adds more strength the leading edge to fight off dings and rough landings! - I use CA on small joints and Gorilla Glue on the main joints. You need strong glue on the spar, motor mount, vertical pieces, and tail booms. - I'm using hot-glue to keep the servos in. - The booms are 1/4" x 3/8" basswood. - The motor mount shaft is 3/8" square basswood. - The motor mount is an E-flite square mount. Only two screws fit the back of the 400XT, but that's all she needs. I like this better than a flat piece for a radial mount. ...oh, did I tell you she's fun to fly??!! Last edited by YarSmythe; May 13, 2014 at 04:55 PM. Man that flies smooth!! Where is the CG point?? Directly under the carbon rod. Roughly 2.5" inches. KF step?? Not sure what you're asking. Right now I fly the 400XT with an APC 8x6SF prop but will be trying out a 9x5 GWS HD prop soon. Someone recommended I try the HD prop which might give me better performance. 12.5 amps exceeds the recommended power consumption from the 400XT. Supposedly the 9x5 GWSHD will bring it down to 11 amps. Ya the 9050 is the ideal prop for a esskay, 20+ oz at 10+amps. the liter the plane the less the WOT amps are in the air. Kline-Foggleman Wing foil, there's been a lot of builds with it, it's a steped foil, either on top or under the wing. I have never heard of the "KF wing foil"...but, to answer your question, yes, there is a 'step' in the wing. The first 2.5" are double layered (10mm), under the wing. The rest is 5mm to the trailing edge. I'm pretty sure i'm not the only one out here that has tried a pusher prop f&L. My compliment Yars, that's a nice little "boomer". I want to build one ASAP.